On July 3, 1884, the first shipment of iron ore from Charlemagne Tower’s Minnesota Iron Company left the Soudan Mine near Lake Vermilion. It rode the Duluth & Iron Range Railway to the massive ore docks of Agate Bay (now Two Harbors), was loaded onto the steamer Hecla, and travelled to Philadelphia, ushering in an industry that the entire Arrowhead region’s economy has relied on since (albeit to dwindling degrees). Six years later, at Mountain Iron, Lewis Merritt’s sons drilled for ore. The next year they built the Duluth, Missabe & Northern Railway to transport the ore to Duluth, giving birth to the Mesabi Iron Range. Later, the Cuyuna Range would join the Mesabi and Tower’s Vermilion Range to form the Minnesota Iron Range in the heart of Minnesota’s Arrowhead country. Iron mining would ebb and flow for the next one hundred years, booming during both world wars. The blast furnaces of Duluth Iron and Steel Company and U.S. Steel, fed by ore from the Iron Range, cranked out steel to feed the war machine. 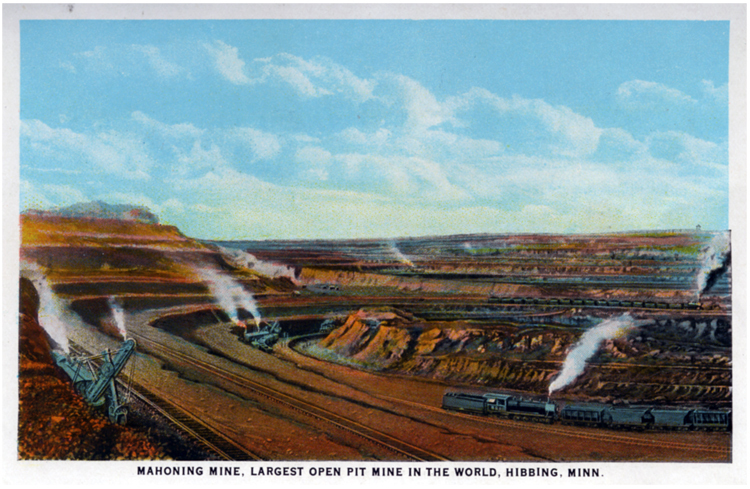 The Mesabi Range alone produced twenty million tons of ore during World War I. After World War II the Mesabi Range continued to produce impressive tonnage (and continues to do so), but the Vermilion shut down in 1963; the Cuyuna, which never obtained the production level of the others, closed in the mid-1970s. Iron Mining in the 1890s used drilling and blasting to loosen extremely hard iron ore (drilling was also used to locate the ore) in the open pit mining process. A compressed air drill with a diamond-tipped bit was used to bore holes three inches in diameter and about four feet deep; the holes were then filled with dynamite or nitroglycerin and the explosives detonated. Blasts occurred every three hours and could be heard up to forty miles away. The explosions could also trigger the sides of mining pits to collapse and often covered nearby miners’ homes with debris. Miners used a cut-and-slice back sloping system, which gave the mines a stepped appearance, as seen in the card at lower right. Underground slope mining was later used at mines with softer ore. If the ore was close to the surface, strip mining was employed; soil and other material was scraped away until the ore was exposed, then the ore was broken up by blasting. Both the strip mining and open pit mining methods relied on steam shovels to load ore into railroad cars. A locomotive would pull a train of cars to the giant ore docks at Duluth and Two Harbors, where the ore was loaded onto ships or delivered directly to Duluth’s blast furnaces. In the 1930s, when hauling by rail became impractical due to the terrain of newer mines, the mining companies turned to heavy trucking, and steam shovels were replaced by conveyor belts. Once the ore arrived at a blast furnace, it was turned into pig iron (an iron-carbon mix) in a process called smelting—essentially, extracting sulfur from the ore. The furnaces (huge chimney-like cauldrons lined with refectory brick) were loaded with ore, coke, and limestone, then pre-heated air was forced into the middle of the furnace–that’s the blast. The mixture was heated in the middle for more even burning. Through this process, the unwanted materials formed a heavy liquid—slag— which was poured out of the bottom of the furnace through a valve. Another valve allowed the pig iron, lighter than slag, to be removed separately. But pig iron is very brittle and had to be processed further to lower its carbon content. To do this, the pig iron was placed in a special rotating container, which in turn was blasted with high-pressure oxygen. The impurities were removed from the pig iron, leaving behind both carbon monoxide and carbon dioxide. The purified pig iron was then used as wrought iron or converted to steel with the Bessemer process, wherein further impurities were removed by blowing air through the molten pig iron. Following World War II, high-grade iron ore was nearly mined out, so the industry turned to taconite, a flint-like rock with high silica and magnetite iron content. Taconite is processed by grinding it into a powder, then separating the iron from waste material with powerful magnets. Next, the powdered iron concentrate is mixed with limestone and bentonite clay and rolled into pellets, which are subjected to very high temperatures to oxidize the magnetite to hematite. The nuggets are then used to make steel.